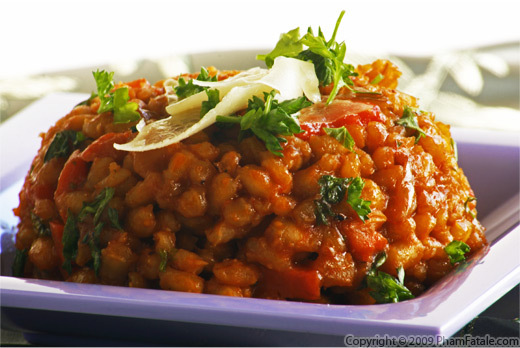 Moghrabieh, like rice or pasta, is a palette upon which many flavors can be layered. 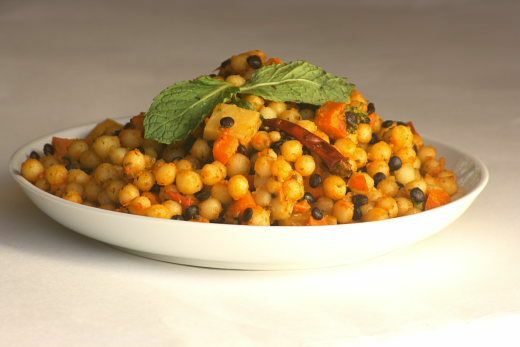 I love the combination of couscous and beluga lentils, and to this I added cumin, butternut squash, mint, onion, turnip and red chiles. It's a healthy and delicious meal that hits the spot on a cold day. In Paris, where I grew up, there is a large population of North Africans, so I was familiar with the tiny variety of couscous. 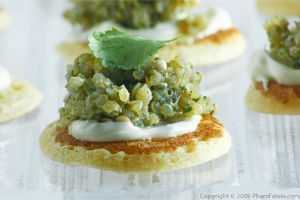 My first introduction to the larger Lebanese variety was when I visited Las Vegas a few years ago. My husband ordered a plate of moghrabieh with lentils and vegetables. He fell in love with it, and so did I. I've been cooking with it ever since. The butternut squash and turnip should be cut into 1-inch squares. In a bowl, toss the diced butternut squash in molasses, light corn syrup, salt, 1 tablespoon of olive oil, cumin powder and paprika. Brush a baking sheet with olive oil. Place the butternut squash and turnip pieces without crowding them. Roast for 20-30 minutes, until slightly browned and softened. Set aside. 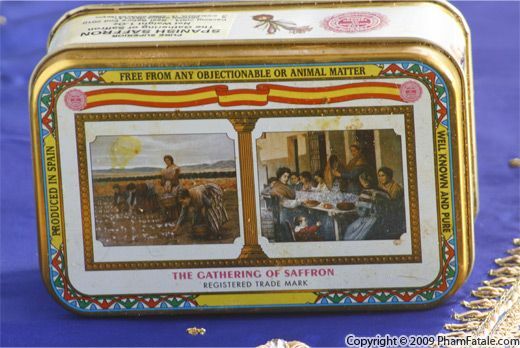 In a mortar and pestle, grind the saffron threads. Add about 1/4 cup of water. In a deep saucepan, add the onions. Cook until slightly golden, stirring frequently to prevent the onions from burning. Add the ginger garlic paste, cumin seeds, cinnamon stick and cayenne pepper and cook for an additional 2 minutes. Add the moghrabieh. The oil should coat all the grains. Pour in 1-½ cups of vegetable broth and stir constantly. After bringing the liquid to a boil, season with salt and incrementally add the rest of the vegetable broth (4 cups total) in 3 stages (whenever the liquid evaporates). Cook on medium-high for about 20-25 minutes. Check the liquid and doneness of the moghrabieh and periodically add an additional (up to 1-½) 1 cup of water if all the liquid is absorbed; and cook 10 more minutes (if necessary). The moghrabieh should be cooked but still firm as it will finish cooking with the root vegetables. When the moghrabieh is almost cooked, add the roasted butternut squash and turnip, lentils, saffron liquid and chopped mint. Adjust the seasoning with more salt (if necessary) and white pepper. Cook for about 5 minutes until the lentils are warm. Finish with lemon juice. Remove and discard the cinnamon stick. 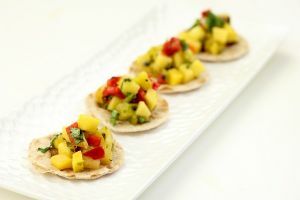 Garnish with fresh mint leaves and serve immediately. Moghrabieh looks like a peppercorn-sized couscous grain. It was spelled "mograbayeh" on the package from the Middle Eastern store where I bought it. 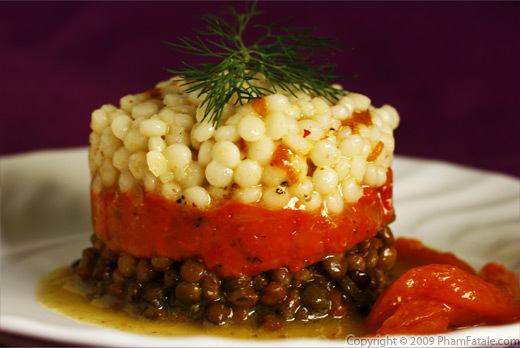 You could substitute barley, orzo or Israeli couscous for the moghrabieh. If you live in the Bay Area, check out the Rose Market -1060 Castro St, Mountain View, CA 94040. Coating each grain in oil prevents them from sticking to one another. You can make butternut squash risotto if you have more roasted butternut squash. It's important to add the warm liquid in stages to ensure an even cooking of the moghrabieh. Watch it closely! It's important to pour ladlesful of warm stock. The key is to pour the liquid incrementally and never let the dish dry out, or the moghrabieh would burn at the bottom of the pan. You've probably noticed I use ginger garlic paste a lot in my cooking. It tastes great and is very healthy for you as well. Just clean the ginger, carefully removing any dirt. Peel the ginger root with a paring knife or the edge of a spoon, then finely chop the root. Place the chopped ginger and 5 cloves of garlic in a blender and, add about 2 tablespoons (or more) of water for a smooth flow. Transfer to a jar and store in the refrigerator. You can keep this paste for at least a week in the refrigerator. 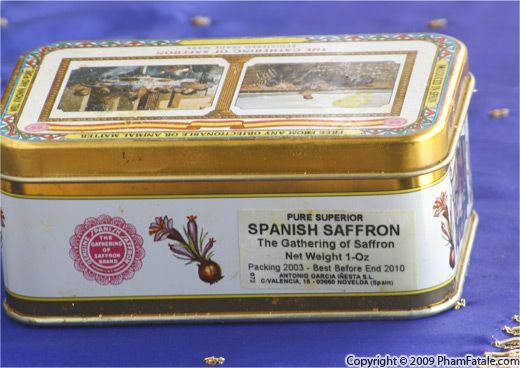 Saffron is quite expensive; I usually get it at a more reasonable price at the Indian market. It gives the rice a yellow hue and a nice aroma. 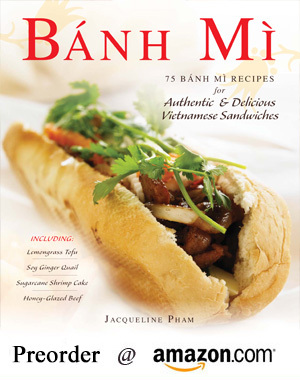 Published By: Jacqueline Pham on January 19, 2010. 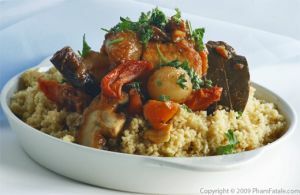 I LOVE Lebanese couscous! 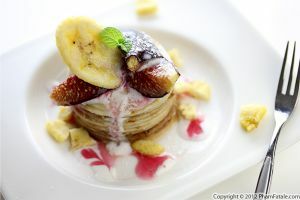 Great take on it, we are having perfect weather for this kind of dish. Yum! This looks both flavorful and healthy. Can't wait to try it. I'm not familiar with Lebanese couscous but it looks a lot like the Israeli version which I absolutely love! It's more like pasta than conventional couscous. I agree. At first I thought they were the same, but after doing some research I found that the wheat is processed differently in the Israeli version. The Lebanese variety is a little chewier. They're both great though, and I use them interchangeably. 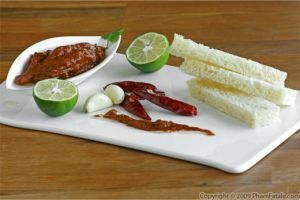 Recipe looks great, going to try this out. Do you use white turnip or yellow turnip (Rutabaga) when you make this? I used white turnip. Let me know if you have other questions and I hope it turns out well. Have a great weekend! Hi, thanks for the recipe. In the directions you refer to molasses but this is not mentioned in the list of ingredients.Do you mean pomegranite molasses or dark sugar ?